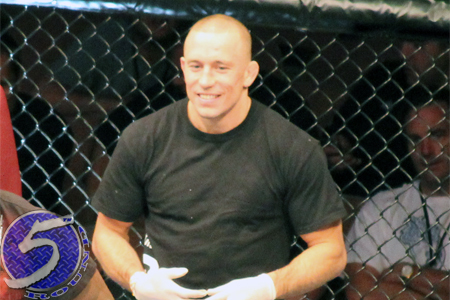 Remember a couple weeks ago when UFC welterweight king Georges St-Pierre’s (pictured) trainer, Firas Zahabi, said GSP would consider retiring after meeting Johny Hendricks at UFC 167 if he no longer had the motivation to fight? Well, St-Pierre’s team, including Zahabi and manger Rodolphe Beaulieu, were in damage control on this week’s edition of “UFC Tonight” by stating Zahabi’s comments were “taken out of context.” Beaulieu clarified that his client has long professed he’d hang up his mixed martial arts gloves once he lost the desire to train. However, that day is not today nor is it coming anytime soon. In fact, Beaulieu claims GSP has never been more focused or motivated to scrap. St-Pierre has posted 11 consecutive lopsided victories, with the last eight being of the championship title defense variety, en route to becoming the division’s G.O.A.T. The 32-year-old meets arguably the toughest test of his career in Hendricks on November 16. MGM Grand Garden Arena in Las Vegas, Nevada hosts the shootout.